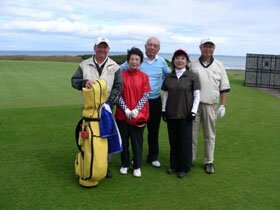 As we had promised you last year, we came back with our old time friends, Mr. and Mrs. Matsui. Now they understood why we strongly urged them to visit Scotland to enjoy playing golf. Playing golf in the links is a fantastic experience to be with Nature. Big sky, clouds, winds, sea,. grass, flowers and there you find the true joy of playing golf. We played at Gullane Nr. 2, North Berwick West Course, and Kingsbarn as you had recommended. Each course has a different character and we could enjoy everyone of them. Thank you very much for your kind support and wonderful arrangements of our trip. You are really wonderful to make our wish come true.